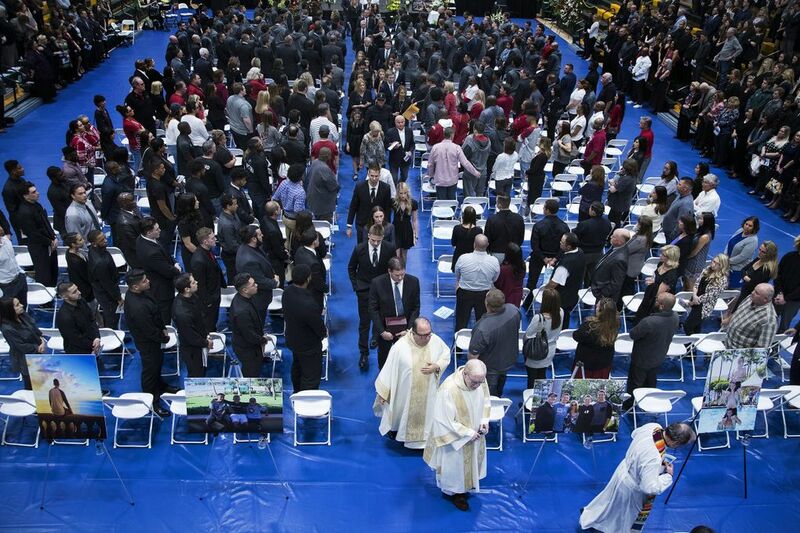 Hundreds attended the two-hour long service at Damien High School in La Verne, Calif., to lay to rest Tyler Hilinski, 21, who took his life earlier this month. LA VERNE, Calif. — Beneath the San Gabriel Mountains, in an unmistakable American gymnasium, with the bleachers brightly green and yellow, the basketball hoops folded up familiarly toward the ceiling, and the hanging banners telling of bygone happy championships, there gathered Saturday about 800 human hearts in many states of brokenness. 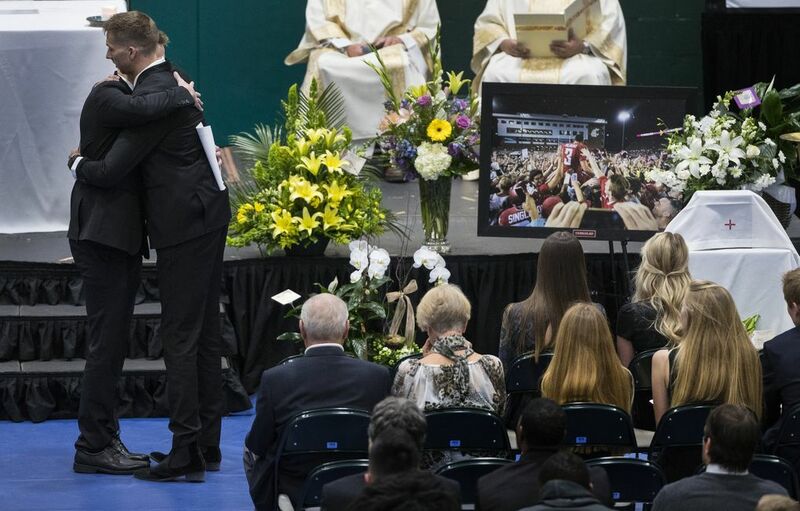 With that and other words in the Damien High School gym, Ryan Hilinski eulogized his older brother during a two-hour service, as did aunts, uncles, grandparents and another brother who read the words of their mother. All in attendance — the Washington State football team, Washington State football fans in their crimson and gray, teammates from nearby Upland High School, abundant friends — tried the hard assimilation of the inconceivable: that Tyler Hilinski, 21, rising Washington State starting quarterback, had taken his own life using a rifle Jan. 16 in Pullman. Reverend Charles Ramirez, in his homily, called it “one of the most difficult funeral masses” and spoke of “the pain, the sense of loss, the sense of disbelief this has happened.” He pegged the crowd as “at a loss to figure out why Tyler decided to pass on.” He told of Hilinski as a willing listener for others, as when driving a teammate to counseling, but noted how Hilinski didn’t share likewise, so, “That’s why we don’t know.” He told of Jay Guillermo, the former Clemson center who took a year off to deal with mental health issues, and Ramirez wondered aloud whether Hilinski’s death might spur a change in approach to a national issue. To careful observers of college football, Hilinski was the 6-foot-3, 213-pound backup to the prolific Luke Falk, who just finished his eligibility, just missed the Senior Bowl to attend this service, and who sat amid his former teammates, several rows behind Coach Mike Leach and assistants. Hilinski completed 130 of 170 passes in the 2017 season, including 25 of 33 for 240 yards and three touchdowns to pilot a soaring comeback win over Boise State, which wound up only after three overtimes and with Hilinski riding off on teammates’ shoulders, which made for one exhilarating American photo. 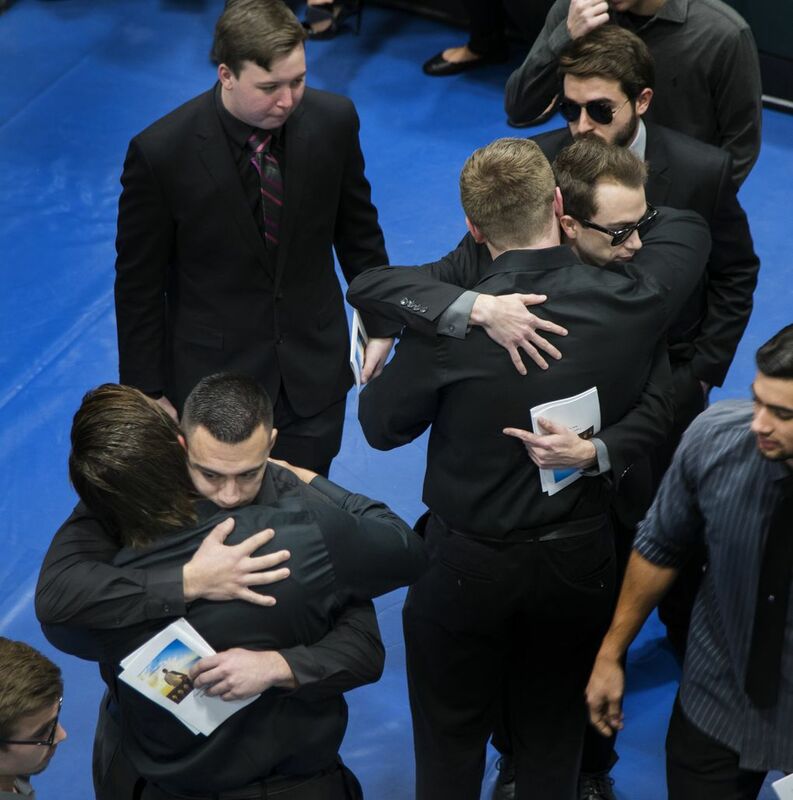 Now that photo rested on an easel amid 10 flower arrangements at the front of the gym, while the people who loved Hilinski painted a picture that made him sound irresistible and deepened the confusion and anguish. It faded to a final, still photo of an American quarterback in June 2014, shortly after he committed to go to college, sitting on a balcony fence in Capri, the Italian island, looking out over the Bay of Naples near the Mediterranean, facing away in a baseball shirt, white with blue sleeves. With the sky half-blue and half-clouded, the sun screaming behind the clouds, he sits alone even while in life, he clearly was not. This story was originally published on washingtonpost.com. Read it here.